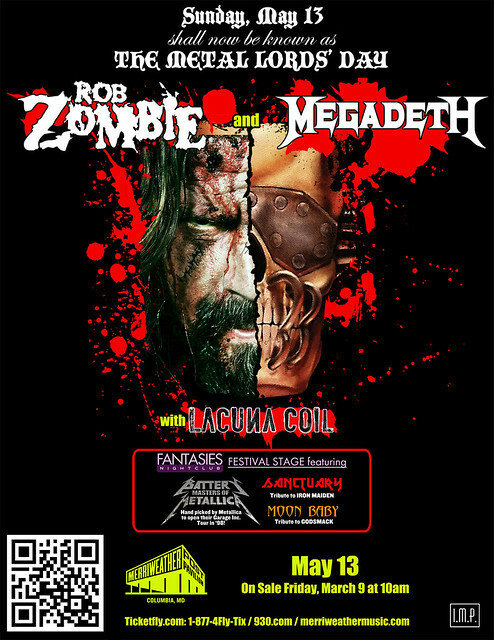 Megadeth and Lacuna Coil on the same event… My concert news alert crew must be dead, thanks metal chris. the tribute bands make for awesome openers. I wanna see Megadeth again! 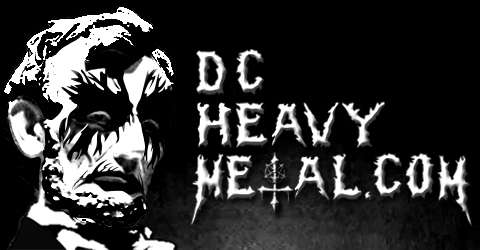 I saw them at Merriweather back in 2008 for Gigantour. One hell of a show! Definitely Megadeth! They were the first thrash band I got into, I believe the song was “99 Ways to Die.” I just couldn’t believe the aggression and power behind their music. It made me want to get angry and shove my fist in the air. It’s such a freeing feeling and it made me a better, happier person. Thanks for doing these awesome giveaways Metal Chris. I must see Rob Zombie before I die, maybe this is my chance! It’s going to be Megadeth. I saw Rob Zombie leading White Zombie a a few times back in the day. He’s still good.., but not as good as the WZ days. I would love to see Rob Zombie!!! It’s amazing that’s who really got me going on metal… Thank you Rob! Dude you KNOW who I want to see. I would like to see Lacuna Coil. Rob Zombie all the way. I got to see them do holy wars from start to finsh, best show of my life. Megadeth, never saw them live. Congratulations! You’ve won the free pair of tickets! Rob Zombie!!! That guys show never ceases to amaze me. I want to see MEGADETH!!!! Mega-deth! Mega-deth! I’ve been listening to Rob Zombie and Megadeth since junior high, but I’d especially love to see Lacuna Coil! HANDS DOWN….LACUNA COIL…..MY FAVORITE ALL TIME BAND! the other two are both a close 2nd tho.. Met Dave M. and the band back in the 80’s at an instore in Cleveland, good times. I really want to see Lacuna Coil. If I can win these tickets, my fiend would be so happy to see Megadeath and Rob Zombie. ALL THREE BANDS ARE EXCELLENT! BUT THE BAND I LIKE THE MOST IS LACUNA COIL! THEY ARE AWESOME LIVE! CRISTINA IS AWESOME! Rob Zombie! Best Rock show…hands down!! Rob Zombie puts on one of the greatest live performances I have ever seen! I’d always be stoked to see him live! LACUNA COIL!! They are so amazing, and I am so glad they finally caught on in the US! I would love to see Lacuna Coil. They are one of my favorites. I just love their new album. I would also love to see Megadeth. Every time I hear a song from them. I think of my brother who is a Marine. Hardly get to see him. He loves to play their songs on his guitar. He is a very talented guitar player. But anyways. Would love to win something for once!!! Lol! I like all 3, but Lacuna Coil is my pick of the 3. I’d love to see Lacuna Coil again, I haven’t seen them in two years and they were my first concert so it’d be awesome to see them again :D.
I’m willing to drive from Philly to see Megadeth! I love the three bands! In my car right now it’s Zombie at maximum volume. But if I look over the last years I would say Lacuna coil is my favorite. I’d like to see Lacuna Coil most! I love all 3 bands as well, granted I love Lacuna Coil & Rob a teensy bit more than MegaDave. Still all awesome bands! I am itching to see Lacuna Coil! has to be lacuna coil. how could i pass up the chance to see my future wife in person? I want to see Lacuna Coil the most! Granted, I’ve been a fan of Megadeth & Robb Zonbie for years, but LC is what I listen to most! I’ve been to their last three concerts in Maryland (Rams Head Live twice & Recher in Towson) and I would love to see them again! My dad (yes, my dad – he’s 60 & loves to rock!) introduced me to their music a few years back & took me to their concerts – I would love to repay the favor! Lacuna Coil! I always find out last minute they are coming to town! I wish I had more time!!! with no hesitation, especially because Cristina is going to sing A Tout Le Monde with Megadeth. EVERYONE! I saw lacuna for the first time in January, one of their only headlining days, and it was amazing! I was bummed to miss megadeth though. And rob?! It’s freaking rob zombie! What an unforgettable line up! I missed them a few years ago so I’d love to catch Lacuna Coil now that they’re back in town. Lacuna Coil! They are my get me through everything music!! Megadeth, because I’m going to dress up like Marty Friedman and dive on stage to solo on Hangar 18! Megadeth will be the best. Though, I have yet to see any of these bands live. Hoping to make this show my first with my wife!